Home CDN , children , crafts , feature , holiday , holidays , homeschool , January , papercrafts , printables , US , worldwide January 8th - Elvis Presley Freebies! January 8th - Elvis Presley Freebies! -- Elvis Aaron Presley was born to Vernon and Gladys Presley in a two-room house in Tupelo, Mississippi, on January 8, 1935. 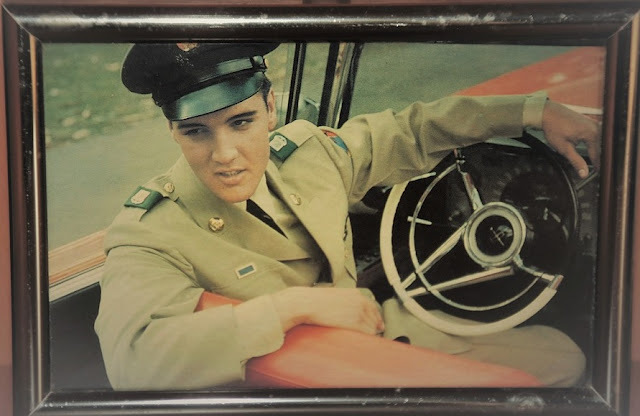 His twin brother, Jessie Garon, was stillborn, leaving Elvis to grow up as an only child. In 1954, Elvis began his singing career with the legendary Sun Records label in Memphis. His musical influences were the pop and country music of the time, the gospel music he heard in church and at the all-night gospel sings he frequently attended, and the black R+B he absorbed on historic Beale Street as a Memphis teenager. -- A comprehensive and in-depth tribute to the iconic rock-and-roll legend provides complete coverage of every aspect of his life, from his disadvantaged youth and meteoric rise to fame to his marriage to Priscilla and untimely death, in a detailed resource complemented by hundreds of photographs. With its abundant photos and memorabilia, one could pore over its pages for days on end. • 2019 Elvis Presley Calendar -- Plan ahead and be even more organized with this celebrity-themed wall calendar. Use it to mark special dates, look forward to vacations, and jot down notes on spacious daily boxes. With his vibrant images, it serves as a cool wall art decor too! - It is a day to celebrate bubble baths in every way you can think of! The perfect time to pamper yourself with a warm bubble bath. Make a tub of bubbles, soak yourself and bust the stress. Why not try making your own bubble bath? Share some soothing bath recipes or even have a bubble bath party! - Celebrated each year in Greece to honor midwives and all women. On this day women stop their housework and spend their time in cafés, while the men do all the housework chores and look after the children. In some villages, men caught outside will be stripped... and drenched with cold water. - Devoted to sending rousing ripples of joy and good cheer, kindness and courtesy, happiness and humor, sacredness and silliness to those you meet and greet. You will be spreading the contagious disease called JoyGerm Fever. - Since students have show and tell at school, adults should get to do the same. Why should your kindergartner have all the fun? Now you can really show your friends or office mates just how weird you really are. - President Lyndon Johnson declared a War on Poverty in his State of the Union address on January 8, 1964. He stressed improved education as one of the cornerstones of the program. The following August 20th, he signed a $947.5 million anti-poverty bill designed to assist more than 30 million citizens. - A time to appreciate English toffee, a chocolate brittle treat. English toffee is considered to be the favorite toffee of North America. Typically, English toffee is made with chocolate, sugar, butter, almonds, and vanilla. - The first milk cartons were distributed in the San Francisco area as early as 1906, but there were still improvements to be made. In 1915 John Van Wormer received a patent for his folded paper milk carton referred to as a paper bottle . Van Wormer, who owned a toy factory in Toledo, Ohio was prompted to create a carton after dropping a glass bottle of milk. His paper cartons were delivered to dairies in flattened form. The dairy could then fold, fill and seal the cartons. - A day for all of you ladies out there to go out and watch the guys. After all, they have their fun watching the ladies. Now, it's your turn. It is okay to perform Male Watching discreetly, or quite visibly. Single, unattached ladies may prefer to be seen male watching... for obvious reasons.